I like doing deadlifts but it seems like the first rep is always the hardest (for every weight I tried) but then it becomes easier, maybe because I don't believe I will actually be able to lift the weight off the ground. Once I get one rep done, I know I'm primed for more and this is how I felt on Monday when I did the 190 lb set. I thought for sure I would only be able to belt out 5 reps and I did 7 with a little gas still left in the tank. And then I took Tuesday as a Rest day! I could not get up for the gym. 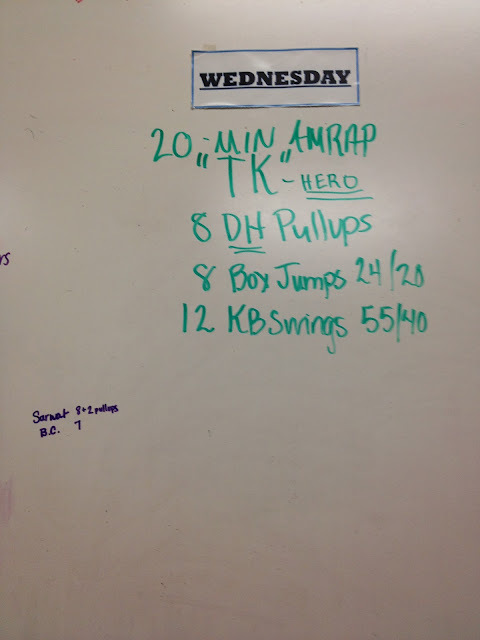 I did 8 rounds and 2 pullups. For the first round I used the purple (1") band to assist and then I had to switch over to the green band (1.5" width) but I did attempt 2 pullups for every round with the skinnier band. I have a REALLY long way to go with pullups. 5 sets of 10 reps Cleans @75% max, I did this with 75 lbs and worked on my technique, we took about 20 minutes to finish this. The annual body fat challenge began this week at my gym and the goal is to lose 25% of your bodyfat, I'm still confused whether that's 25% of your % body fat or 25% of your body fat weight in lbs. I'll figure it out before the 90 days are over. So I'm forking over $75 and will get my $75 back if I lose the fat, if I don't lose it, the money goes to the person who loses the most body fat in the gym. Secretly I hope it's me this year! 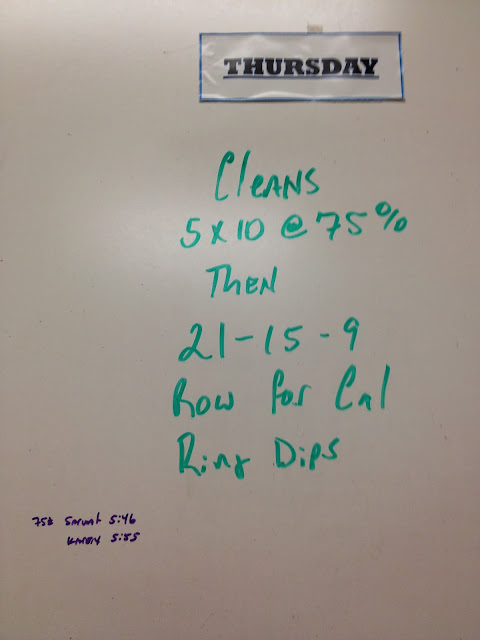 1. in the 90 days, do toes to bar with increasing reps until you get to 90 toes-to-bar, so on Thursday I did 2 reps! Toes to bar is hanging from a bar and pivoting up to get your toes to touch the bar! It is easy for 3-5 reps and gets progressively harder. 2. Do 90 pushups per day, I did 20 on Wednesday, 30 on Thursday and am working up to 90 pushups (serious pushups, not girlie pushups). I did break them up in 10 reps at a time because serious pushups are quite difficult! I hope in 9 days to get up to 90 pushups and stick to 90 pushups for the remainder 90 days. I haven't actually gotten my body fat measured (come Monday) but I started the healthy eating plan which means I have banned sugar, bread, pasta, cereal and white potatoes from my diet. I hid my chocolate chip bag and gave away all the Halloween candy so there is no more temptation at home. It's only been 2 days so far and no problems yet! I found that if I plan my meals and snacks, I am much much less likely to stray and eat badly. I am making an effort to also eat at least 100 gram (target is 120 grams) of protein every day and keep my carbs > 120 grams but less than 200 grams. Fat works out to even things out. For bike rides, I'll still eat half of a whole wheat tortilla with almond butter (much better than Sport Jelly Beans and Cliff Shot Bloks! ), that will be the only time I eat something flour based. 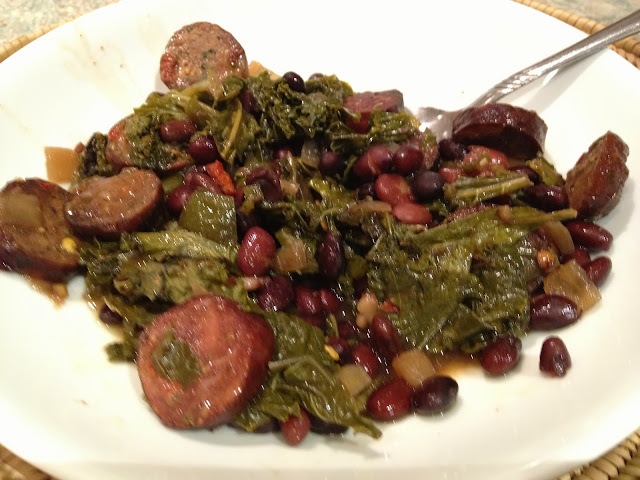 Today's healthy eating was a black bean/kale/chicken sausage thick soup, it was really nice coming home to that cooking in the crockpot.